Start your week off with a smile thanks to the video [Sammy] put together. 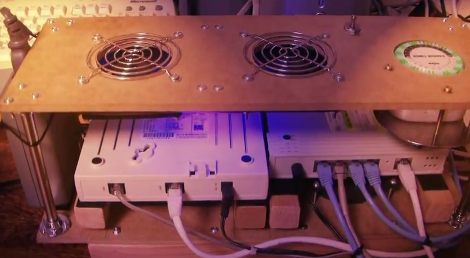 It shows off the cooling rack he made for his network equipment. The project was developed out of necessity as the summer weather was causing his modem and router to heat up and at some point one of them would just shutdown and refuse to work again for hours. We haven’t run into this ourselves but it’s good to know that over-temperature safeguards have been built into the equipment. His solution was to build a rack that offers fan cooling above and below the two pieces of equipment. As with most of his projects, we think making the video (embedded after the break) was half the fun. In addition to playing around with a turntable for some extra special camera effects he gives us a good view of the overall build. The base includes spacers and velcro strips to hold the equipment in place above a pair of exhaust fans. The standoffs at each corner of the rack suspend a second pair of fans above the equipment. But it wouldn’t look nearly as good without some custom LED effects thrown into the mix. This is purely timer-drive. It’s a plug-in module that uses mechanical timing to switch mains. But some creative circuitry (or a small microcontroller) could implement temperature-based switching instead. Ridiculous. Crack open the case stick in a heatsink or something. No need for this. However must say; excellent build quality. Had the same issue the day before. I just drilled an 80mm hole and stuck a fan on it. The fan is connected to the router psu,with a switch. As said before me, excellent build quality,but a bit over-kill? Very usefull in israel, my network has been shuted down every day atleast 5 times a day. worth the build i guess, i’ll check it out! I always thought they made devices with the various climates in mind, and at least the climates of the countries where they sell it. But I guess not then. Is that new or was it always like that? The only thing useful in Israel is a plane ticket. Also, keep in mind that if your ambient temperature is above what the chip will stand, it doesn’t matter how much of that hot air you blow on it. it will not be cooler than the surrounding air. Taking off the cases and mounting the electronics to a board, alone, might be enough…at least it would make the fans a bit more effects, you may only need one. I used to run into this problem with my cable modem and router. A simple 15 dollar fan from walmart fixed it. The fan kept running literally for years until the bearings started going bad. I’ll concur that this might be a little overkill for a home setup… but I built something similar to this in a testing lab where we had several rows of 12 cable-modems each in a 19 inch rackmount. At first, we used just the ambient datacenter cooling, but modems #5 and #6 in each row tended to overheat (and in one case started melt). We got ahold of some telco rack-mounted fans, mounted them above and below each set of modems, and applied -48vdc. Modem temperature dropped quite dramatically after that. Didn’t get through the whole video, but if he spent that much time building the thing, why did he make it timer based? Seems like it would have been trivial to add a temperature (and humidity while we’re at it, SHT15?) sensor and have it turn on and off at certain thresholds. *shrug* He could have also done what my last roommate does, put them on top of a USB-based laptop fan. Because making it temperature controlled would require an Arduino, and he probably doesn’t have any of those handy. But yeah,one a timer? Huh? Just removing the cases and setting the boards vertically would probably solve the problem. As they heat up convection would pull sufficient air up across the surface of the boards. Way easier and more reliable. Wouldn’t it make more sense to use a bimetallic switch (aka thermostat) or (if overkill is a requirement) a thermistor? For temperature dependent applications, a timer just wouldn’t satisfy me. Overheating network gear is a problem in home gear all the time in Australia. Not so bad the past few years, but i’ve had multiple units die due to overheating. A netgear router i had for a while turned from white to off-coloured yellow from the heat in some places!!! this is my solution, cut a slot in the router case, and installed an optional fan which came with my actual motherboard. I’m surprised he used such small fans (looks like 80mm or 92mm). Massive computer fans are common nowadays, up to 200mm, but maybe he was just working with what he had lying around. was having 5~10min dead period on my network. traced all the way to the DSL modem. only to find out that AT&T deliberately breaks my dsl connection every day. Is it just me or was there no sound in the video? Looks like he’s using unfinished MDF, he should seal that off for health reasons.